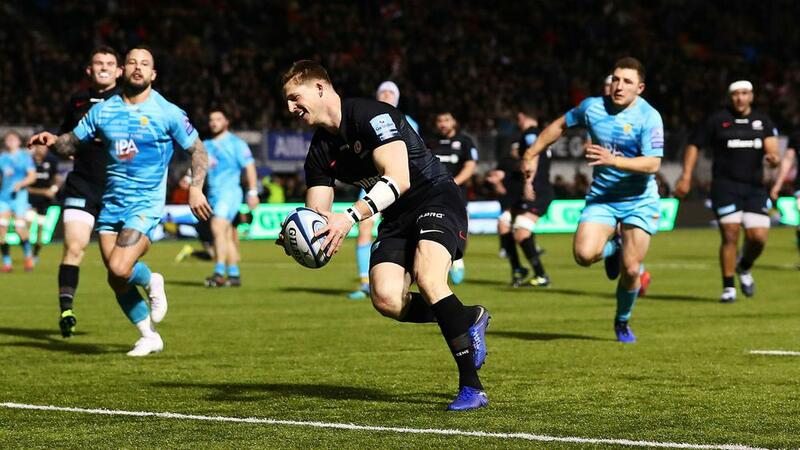 Saracens closed the gap on Premiership leader Exeter Chiefs by producing a second-half fightback to beat Worcester Warriors. With the table-topping Chiefs surprisingly slipping up at Northampton earlier, another upset appeared on the cards when Worcester held a 17-11 half-time lead at Allianz Park. However, the reigning champion rallied impressively after the break, tries from Calum Clark and David Strettle helping the hosts record a 25-17 triumph that leaves them just a point behind Exeter after 11 matches. In the day's late kick-off, Harlequins made a fast start and held firm in the closing stages to record a 20-13 victory over Wasps in front of a sell-out crowd at Twickenham. Alex Dombrandt touched down inside a minute and a pair of Marcus Smith penalties helped put Quins 13-3 up at the break, though their opponents hit back early in the second half when Will Stuart touched down. Crucially, Quins scored the next try, Joe Marchant stretching out to ground Danny Care's clever grubber kick in behind the defensive line. Smith landed the conversion and while Lima Sopoaga's penalty put Wasps within striking distance, they were unable to make their late pressure tell. At Kingsholm, Sale Sharks continued their surge up the table by upsetting Gloucester, which let slip an early 10-point advantage to lose 30-15 at home. Chris Ashton, Faf De Klerk, Rob Webber and Denny Solomona all touched down for the in-form Sharks, who claimed a bonus-point win on their travels to move up to sixth place.